The most common way to get traffic form Google is by optimizing your website and getting it ranked on first page of for your target keywords. The other alternative is PPC advertising which can be costly. However, while ranking a website is the best long term strategy for getting search traffic, there are other ‘free’ options available. In this post we discuss 4 methods of getting dental patients from Google Search without ranking your website. Your Google My Business Listing is your opportunity to rank in the local 3-pack section of local search results. Make sure you follow Google guidelines and recommended best practices when setting up the Google My Business page for your dental office. Collect some patient reviews, add some relevant content and build citations on local directories and data aggregators. Your Google My Business Page should be ranking on first page of Google soon! An example is shown below. The future of web is Video. But even today video marketing and video content is gaining traction. Youtube (also owned by Google) is the most popular video sharing website in google and popular youtube videos often make there way on the first page of google. Make sure you use your target keywords in the video title, tags and description. Also share the video as much as you can to increase the number of likes and number of embeds. An example of a very competitive dentist keyword with a youtube video ranked on the first page is captured below. Local Directory websites like Yelp, Yellowpages and Superpages are great for promoting your dental office online. Similarly dentist review sites like Rate a Dentist, Health Grades and Zoc Doc are also useful for getting new patients. However, with some optimization you can rank your dentist listing on these sites in Google. 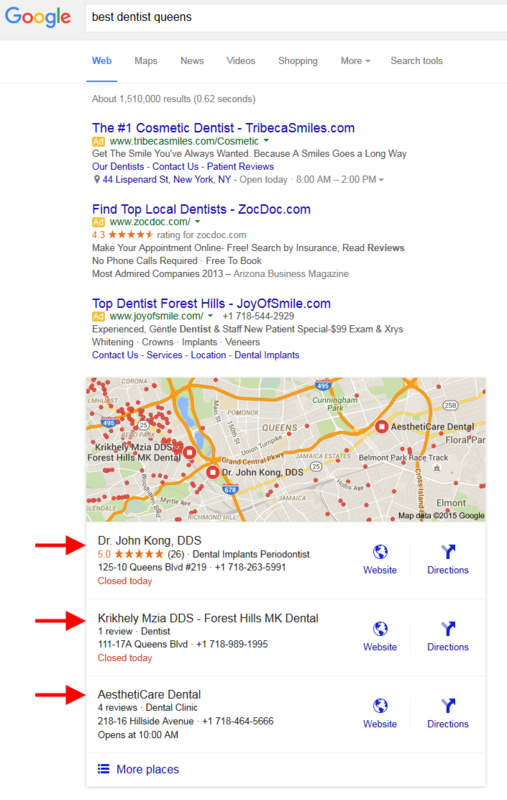 Specially Yelp and Yellowpages are two websites that are consistently coming up for local dentist related searches. Here is an example of a very competitive keyword. Note that there is a yelp listing of another dentist ranking just above this facebook page.